Benjamin Church leads his independent company in open order from behind cover in a skirmish at Tiverton, RI. 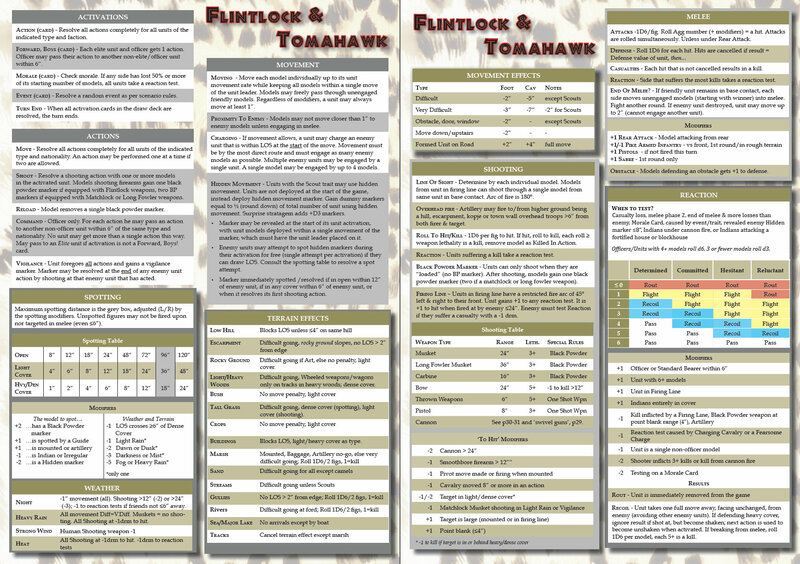 Completing our short series of posts, this time we looked at the Native and New Englander tactics used in King Philip’s War, focusing on tactical aspects of the era and how they relate to tabletop play using Studio Tomahawk’s Muskets & Tomahawks and Osprey’s Pikeman’s Lament rules. Tactics in King Philip’s War reflect the military culture and organisation of the combatants, the weapons available and the strategy of engagement each side undertook – they were similar and different in many ways. Regarding how these can be reflected in our rules I am going to use Muskets & Tomahawks as the baseline ruleset for discussing the tactical depiction of troops as these provide the most granularity when reflecting the unique aspects of King Philip’s War in my view. My King Philip’s War version I term ‘Flintlock & Tomahawk. I shall finish off with Pikeman’s Lament lists so both options are available, each providing a different take and style of play as players choose. New England tactical warfare must be put into the context of the strategies of engagements each side conducted during the war. Only then do we get an understanding on how and why troops should be formed for tabletop encounters which gives King Philip’s War a unique feel from a tactical perspective. When war broke out the Indians conducted warfare as they had always done. Using the natural advantage of their warrior upbringing which essentially schooled them in the arts of war be they against other tribes, hunting for the tribe’s resources, or against any other external force; this uniquely put the Indians in a position where they could wage effective war, each man a natural fighter. They fully understood that the sustainability of encroaching white settlement revolved around settlements, townships and farms which were the lifeblood of colonist expansion. If they were to attack their enemy in a kind of ‘scorched earth’ economic warfare, they may have a chance of driving back white settlement, or more realistically gain acceptable terms in a truce or peace treaty. This meant that they would actively take to fighting the enemy on their own terms by engaging enemy forces when they had an advantage, usually an overwhelming advantage, or at an undefended settlement where any response would be limited or delayed. This set the stage for many of the confrontations of the war. By this strategy the Indians were able to engage in surprise, ambush, raids, property destruction, and a form of terrorising of the population that it was hoped would make continued white settlement unsustainable or severely restricted. It has to be said that this policy did indeed make sense given the resources they had and the weakness of their foe in enduring this type of insurgency warfare. Uniquely, a number of Indian tribes formed substantial permanent fort locations for their communities. This provided a strong base point of operations and supply but at the same time made them vulnerable to attack at a specific location. This of course was highlighted most glaringly at the Great Swamp Fight against the Narragansett. All told, over the course of the war Wampanoag and Naragansett war parties burned over 1,200 of New England’s 12,000 houses, making one-tenth of its male population causalities of war at a huge financial burden. This type of warfare is reflected well within Muskets & Tomahawks by using the Scenario Generation method on page 38 when one is setting up play – the standard game captures this strategic aspect of scenario construction very well. When an Indian force is fighting against a colonist force it will invariably have the Slaughter, Raid or Scouting Mission scenario – which is quite appropriate in most games. This Scenario Generator is the standard Muskets & Tomahawks’ game generation system and works as well in this period as it does for the French and Indian Wars. As the war progressed the United Colonists start to produce an irregular or mixed force which enables more offensive style scenarios to be generated in Muskets & Tomahawks – this would be typified by the inclusion of friendly Indian allies and or Ranger company elements. Early in the war when Provincial troop types form the bulk of a United Colonies army, the scenario generation method puts the protagonists in the right strategic roles, setting up thematic games seamlessly. Like many warrior peoples, Indian warfare involved the prowess of individuals over collective action. This entails specific warrior skills transferred directly from daily hunting needs repurposed into warfare. This of course was a continual and/or interspersed experience for many Indian tribes. It wasn’t just Indians fighting colonists but Indians fighting other Indian tribes…warfare was for the most part continual in one form of another. Therefore when we look at Indian tactics on the tabletop they must emphasise the so-called ‘skulking way of war’. This will mean that individual weapon skill results in them firing more effectively than most urbanised colonists who have far less experience with a personal firearm than Indians, who rely on it for their evening meal and protection of their tribe. An interesting image – The raid: Nipmucs, Narragansetts, and Wampanoags attack Sudbury in April 1676. Note the use of bows as late as mid 1676, used in concert with firebrands and muskets…all weapons in use. The archer, firing high, suggests a fire-arrow shot. Many of these aspects of the period are largely defined in Muskets & Tomahawks by the use of the respective troop stats. For the most part Indians of mid-18th century were the same as Indians of the mid-17th century so existing ratings form a good basis for classification. What one will find however when looking at the KPW Indian tribes list is that there is quite a wide variety of Indian warrior options to properly reflect the varying tribes in the conflict and at varying stages of the war – Indian commitment and allegiance was fluid in this time. For example, players wouldn’t normally take the Indians as Dispirited with poor morale in their army however in 1676 summer to fall scenarios, it would be quite common for a number of Indian tribes to be rated as such. This of course is left up to each player’s discretion how they wish to represent their Indian force. Therefore, players of Muskets & Tomahawks will find the Indian tribe list quite familiar but wide ranging. What has been included for Flintlock & Tomahawk are two special rules for King Philip’s War. The first rule is the aforementioned Skulking Way of War. We use this special rule to reflect the significant advantage the Indians had when undertaking operations against colonist forces in the wilderness. Reading many accounts of the conflict it becomes apparent that the United Colonies forces were at a severe disadvantage when operating against Indians, unless arrayed in a fairly static role or fighting ‘indian style’ such as the later formed independent companies. Therefore we repurpose an existing rule in the game and make it a core part of Flintlock & Tomahawk. We do this by allowing the Indian player to use the optional Planning rule on page 11 as standard. When one combines this with hidden movement markers which all Indian forces gain by virtue of the Native trait, these two elements of game design combine to provide the Indian forces with a significant realistic intelligence advantage on table. This produces a very good effect of putting the colonist list forces on the back foot against the Indian tribes. We do however mitigate this disadvantage with the emergence of Colonist irregular troops and attached irregular elements ie for each third of a colonist force made up of Irregular troop types we remove one of the planning cards as per the rule. So, if you have you a supporting uint of friendly indians in your force the Colonist player will negate some of the Native American advantage within the game. This works very well and is easy to implement. The second rule we introduced is called Sentinels. This rule accounts for the Indian player being able to split one unit into two and use them as pickets for his force as well as generating an additional hidden movement marker. This further plays into the concept of the overall intelligence ability and greater mobility of the Indian force against any United Colonies force. This last rule can be considered optional if players feel the first rule is ‘overpowering’. Of the two rules the former is the more useful for the most part as it will provide the Indian play with a good degree of ‘advantage’ he otherwise wouldn’t have in the game. Whilst this doesn’t speak to a direct command and control capability, it does reflect the overall intelligence picture in any particular engagement based on the troop types that are engaged. When Indian forces encounter blundering colonist forces they generally had a quantifiable advantage over their opponent. This rule handles it easily and well in the game system as written. So for players who have used an Indian force in the French and Indian wars, the same tactical use will be familiar using New England Indians as well. What you might find is that with upgrades you can make your Indians quite effective and when you combine it with the planning cards and/or the use of the sentinels ability the Indians become a very effective force when well placed in woodland rough terrain thereby maximising these advantageous traits. However, don’t expect that they are somehow more capable than you otherwise might think they would be. Their morale is still skittish and they will not like taking casualties and operating too often in the open against enemy musketry…particularly as they are organised in units that are small and vulnerable to losses…so the skulking way of war it is! Skulking, sniping and attacking enemy in woodlands is still playing to their strengths and players would be advised to do as they did historically. Of course the scenario you play and the table you lay out will have an impact on all these considerations and a cunning adversary may very well be accompanied by irregular forces to offset your advantage. One last point worth mentioning before we leave the subject of Indians in King Philip’s War, is that the success that they had was often due to the inadequacies of their opponent. Offensive tactics against a defensive mindset and poor quality enemy greatly enhanced their raiding ability and accounted for much of their success. Ambushing against clumsy colonist forces also played into their hands. Against independent companies and christianised indians things will be much more even. Turning our attention to the United Colonist forces we see a wider variety of option upgrades and troop type variant combinations than the Indian Tribes list. By way of explanation it is best to go through each troop type touching on their characteristics and what they represent.. The following troops I categories to portray the possible combinations of troops for King Philip’s War. Players should look to historical prototypes to see which category a force should fall into. Generally this should be fairly obvious but some blurry lines emerge as to the weapon fitout and capabilities of various colonist companies. This type of force would be the least well equipped, the colonist supplying himself with the weapon he could afford or thought appropriate given the perceived threat based on his nearness to the frontier. Thus these militia types would be armed with a mixture of hand weapons, pikes, matchlock or firelock muskets. Having little training they are the least effective forces in the colony. They represent the town militia of a village ie the residents or non active militias, not the organised militia of the respective colony. Often these forces would barricade themselves into a fortified house, send for help and try and fight off any indians of prevent them coming close enough to prevent them setting their defended building on fire. 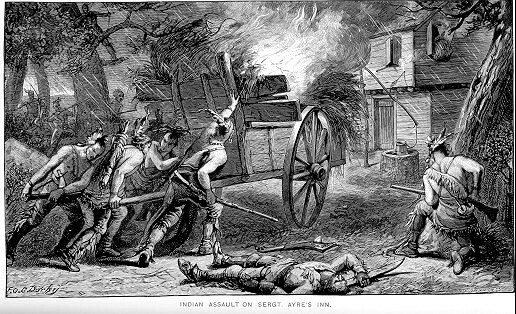 Whilst this tactic may have saved their lives, it left their homes open to destruction which the indians often took advantage off. They can however take the fight to the enemy when formed into large enough groups and from a well defended position, whether barricaded or not. This will often be how your scenarios will play out. In Flintlock & Tomahawk they have have poor shooting ability, poor morale and low aggressiveness as you would expect – they fight to survive. Their offensive ability will be limited so a defensive position of sorts would be the best position for them to fight from or in large groups so as to overwhelm their enemy. Unlike other troops they can be armed with pikes. These cumbersome weapons are not very useful but do gain a +1 in the first round of combat if charged frontally in the open. Needless to say, pike armed infantry in rough terrain will be at a disadvantage suffering a -1 in any but open ground. Thus there are some decided limitations of the pikes use vs an indian enemy…little wonder the weapon was discarded fairly early on. These troops form the bulk of the forces that fought during the war. A typical United Colonist army will be made of these troops. They are representative of the colony militias of Massachusetts, Connecticut, Plymouth and Rhode Island. Their organisation and training reflects a more traditional european view of warfare, less well adapted to the war they had to fight. These troops exist throughout the war. They relied on traditional formed ranks and lines as proscribed in military treatise of the day using both matchlock and flintlock muskets. They form the heart of most forces in Flintlock & Tomahawk. Whilst not compulsory, we allow the option to array your troops in Firing Line due to the reliance on traditional formed rank tactics. This optional upgrade accounts for the varied states of training of the colonist militias. Off all the troops the First Boston Militia company seems to have been a slight cut above the rest and we allow for this force to upgrade their morale to Committed if taken – in fact, they must. Other companies can use the Resolve trait and also increase their morale reflecting increased confidence or experience. In the lists however, most troops start with relatively poor morale (Hesitant) and with training that varies, reflecting the capabilities of many troops during the war. As standard, we provide the colonists with flintlock muskets as their weapon of choice. This can be downgraded to be matchlock musket armed if desired. The effect of matchlock muskets in Flintlock & Tomahawk is that the weapon takes two turns to load. They may only engage in volley fire as well when deployed in Firing Line. Due to the inadequacies of the weapon they cannot use the vigilance rule which nicely accounts for their clumsiness in an ambush situation. Lastly, they suffer an additional -1 to shooting in light rain because of the inefficiencies of the matchlock ignition method. One upside is that troops so armed are ‘cheap’ so you can get plenty of them…numbers vs efficiency…the choice is yours. One other weapon we allow is the Long Fowler Musket. This unusual but interesting weapon provides for a figure to be armed and utilised as a ‘sharpshooter’. This cumbersome weapon requires two actions to reload but does provide a player with an interesting inclusion in his force beyond the normal restrictive weapons he usually has to contend with. By 1676 new tactics and adaptations to wilderness warfare had started to take place. This is reflected by militia companies being able to adopt a looser formation instead of relying on formed ranks as the above troop type describes. This however is not reflective of the independent companies which fall into their own category of Rangers. The experiences of the war by 1676 had been absorbed by some erudite leaders and in an acknowledgment of the effectiveness of indian fighting styles, some colonists leaders and companies started to adopt looser tactical order. We capture this effect in Flintlock & Tomahawk by using the Light Troops rule. For French and Indian War aficionados, this enables the colonist to function in the manner of the French de La Marine units of the 18th century. This nicely captures the adaptation to wilderness warfare without overstating the case or making any hard and fast rules about how troops fought during the war, thus providing options to depict colonist in two ways. They may be taken as Irregulars who have the Scout trait or may use the Firing Line trait, enabling them to fall back on traditional formed rank tactics – the choice is yours. Note the Shooting rating of 5+ is not changed if you deploy as open order infantry ie you will gain a benefit from cover but your shooting ability doesn’t improve your. If you choose the Firing Line trait you will have a chance at increasing your shooting ability but at some cost as you become an easier target to hit; this is intentional, as indians will still have an edge in shooting ability. So their is something of a balance between the two methods of fighting in the game..a nice puzzle for players to contend with. You can however, if taking the Scout trait, arm you troop with Tomahawks thereby increasing their aggressiveness, thereby creating ‘quasi-ranger types’ of a sort ie colonists adapted to wilderness warfare but still not as good as the natural abilities of the indian warriors or specialist ranger units such as those of Benjamin Church. The Independent companies, much eulogised as the forebears of the American Frontiersman/Ranger tradition, developed as in King Philip’s War as English and Indian units. These units were mainly composed of friendly indians with colonist leadership and some rankers. These are very much the equals of the indian warriors in the game and their troop stat line closely resembles the Native American’s abilities. We classify these colonist elements of the independent companies as rangers, this being a catch all for these specialist colonist troops formed as the so called ‘English and Indian’ units. We depict them in Flintlock & Tomahawk very much along the lines of ranger units depicted in the Muskets & Tomahawks game. They are armed with flintlock muskets and thrown weapons, with a commensurate increase in their aggressiveness rating, along with the Scout and Native traits. Depicting Ranger forces as independent units accompanied by units of friendly indians is the correct manner of organising your independent company force, roughly two units of indians to each unit of ranger would be about right. As an added trait, a ranger force may be made up of privateers and thus compose a reduced ratio of friendly indians. Mosely’s company, if taken, must be taken with the Savage trait, their methods being particularly brutal. As mentioned in our previous post, cavalry in King Philip’s War were for all intents and purposes mounted infantry ie dragoons. Whilst forming the smaller part of the overall forces of the United Colonies, they still represent significant contingents in King Philip’s War, being organised either in small detachments or larger mobile forces as well, quite unlike the later French & Indian Wars in the 18th century…a unique feature of the war. Connecticut Colony was particularly forward thinking in its formation and use of cavalry. As early as July 1675 Connecticut ordered each county to raise dragoons and troopers for the defense of the towns in close to a three to one ratio. The terms “dragoon” and “trooper” were used interchangeably but distinctions between the two types of units did exist. Essentially Trooper referred to heavier armed cavalry equipped with armour and primarily equipped with sword and pistol, emphasising a mounted role in attack. Dragoons were armed with “long armes” such as a carbine or musket (although they carried pistols as well) and buff coats were usually substituted for armor. Both could fight dismounted. In Flintlock & Tomahawk the default unit type is the dragoon ie a cavalry unit that is predominately used as mounted infantry, though still capable of mounted attacks. The more specialised cavalry that emphasised mounted tactics can be reflected by taking the Sabre trait thereby enabling a combat bonus in attack whilst mounted., both able to fight dismounted. Dragoons could be armed with musket or carbine, the trooper more likely to have a carbine. …their Indian Scouts from the top of an hill discovered a great number of the enemy that had newly pitched their Station within the semicircles of a Swampe. The English Souldiers were all mounted on horseback, to the number of near three hundred; wherefore the Commanders ordered the Indians to be ready at the top of the hill upon a signal given to run down amain upon the enemy securely lodged in the hollow of the Swampe just opposite against them, while their Horsemen being divided into two squadrons to ride round the hill, so that at the same instant, both the Horsemen upon the two wings, and the Indians a foot rushing down suddenly upon the enemy put them into a horrible fright, making a lamentable outcry, some getting into the Swampe, the rest that were prevented by the Horsemen, and the friendly Indians coming so suddenly upon them were all taken prisoners; Capt. Newbery with his troop alighting from their horses ran into the Swampe after them, where they killed at least a hundred, as was judged by some then present, taking also many prisoners our of those habitations of darkness, the enemy force daring to make any resistance, for none of the English, and but one or two of the Mohegins & Pequods were hurt in that assault. Hubbard’s account of the battle describes a complex, well-planned, and executed battle plan that coordinated an attack by three separate contingents (the southern and northern wings of dragoons, and the Pequot and Mohegan indians). The second in command of this attack, Captain Denison, was a veteran of Oliver Cromwell’s army having fought during the English Civl War and had experience of such large mounted action before. Uniquely cavalry actions are possible or even likely in any King Philip War game, something not usually associated with indian war fighting. Players should not be afraid to create fully mounted contingents as a force or at least include some mounted element as it was quite common. Artillery is very much the poor cousin in King Philip’s War. You won’t need much, or see much of this arm in most games. However, the option is always there to use some small artillery pieces as they did form part of the defence of larger towns and can be involved in some unique scenario set ups – so they were available but one cannon would be more than enough for most games. There is nothing remarkable about the attributes for artillery, these essentially reflecting those type in Muskets & Tomahawks. Players should most likely use light artillery pieces and more likely swivel guns in their scenarios, but as mentioned, the ‘odd’ big cannon wouldn’t be out of place either. It is worth noting that Indians did not likely to be placed under artillery fire and a morale modifier reflects this effect. So whilst these guns may be inaccurate and immobile, they still serve a purpose in any Flintlock & Tomahawk game. So with that we complete our general survey and description of my thoughts for using Muskets & Tomahawks for King Philip’s War. The subtle effects that the rules seamlessly handle really does allow for the period aspects of this war to shine through and feel different from the conflicts a century or so later emphasising changing styles of fighting and various weaponry effects, both of which were evolving throughout this period. …I hope you feel the urge to give them a go. You can get the army lists and playsheet here. Unlike the slightly more detailed approach taken with Muskets & Tomahawks, these Pikeman’s Lament lists take a fairly generic approach in keeping with the main rules. This is not to be taken as a negative as the game is very approachable and excellent for fighting engagements in King Philip’s War. For those not familiar with the game, there is an excellent review here. The game however does not distinguish between matchlock and flintlock muskets which is a fairly important feature of King Philip’s War if both weapons are present on table. I’d suggest a unit rolls 8 and 4 fire dice for full and half strength matchlock armed units respectively – this will downgrade matchlocks easily and simply in the game which should produce the right effect. A New England Confederation force would be made up of detachments from a number of different regional companies when on offensive operations; defensively, militia from specific colonies would likely be present and usually this is when a pike unit would be present due to lack of muskets. Players should feel free to mix and match units from various regiments to create their army. * – most likely Raw in 1675 @ -1pt. Native American tribes are made up of combinations of the following troops up to the agreed points limit of the game being played. They could be made up of Metacomet (King Philip)’s tribe, the Wampanoag, other tribes such as the Nipmuck, Podunk, Narragansett or Nashaway tribes; tribes could ally with one another or represent just one tribe. The number of ways the Indians can be portrayed in this period means that a fair number of options are available. However, as a rule, I would limit the choices to three types from the following list for each tribe.